No surprise that I first caught the cold, cold wind of the Truro Winter Long John Festival on CBC's Rick Mercer Report. It's the funny guy's kind of festival. For me, Truro sounded somewhat familiar, probably because I passed through this central Nova Scotia community during my Great Canadian Train Adventure from Halifax to Vancouver in 2010. The photo above was taken at the VIA Rail train station. 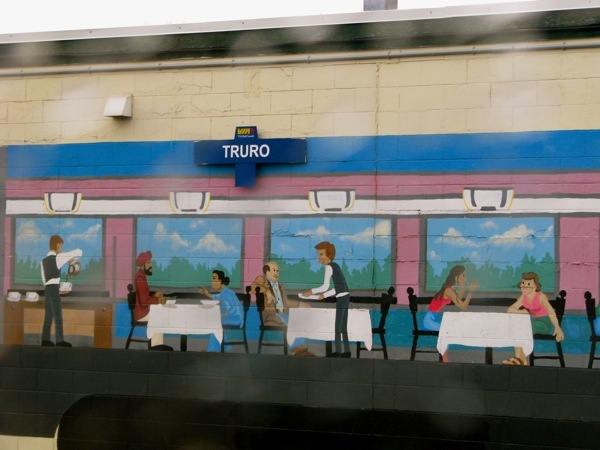 From February 5-11, 2012 the Truro Winter Long John Festival is a week of sports, leisure and cultural activities for all ages and abilities. There's sledding, skating, skiing, snowshoeing plus other outdoor sports. Among the indoor activities is a Beginner Valentine Hardanger Project, where participants create a small embroidery project of "easy counted stitches and little or no cutting." It's led by members of the Marigold Guild of Needle Arts. There's also senior skating, a dance and model railroad show, too. Guided snowshoe treks in Victoria Park will be led by Daisy Roberts and there will be fireworks near the Colchester Legion Stadium followed by a game/match pitting the Truro Bearcats against Dieppe. Not sure what sport it is, but probably not baseball ... most likely hockey. Dieppe is located in neighboring New Brunswick. Although not part of the winter festival, to see a video of a tidal bore in Truro, click on this link. A tidal bore is a "rare natural phenomenon occuring on several rivers emptying into the Bay of Fundy. The surge of the incoming Fundy tide temporarily reverses the flow of these rivers and appears as a crest of water traveling upriver." More information may be found at the Central Nova Scotia website.